I have an aversion to boxed stuffing. It never seems to compare to the homemade kind that I make using fresh french bread and onions and celery sauteed in butter. Yet, I always seem to find it in my cart as I make my way through the grocery store because I simply can't pass up a good deal when I have a coupon and the item is on sale! I figure it'll work in a pinch when I'm low on time to cook dinner. What I hadn't thought of was using stuffing mix in a recipe like this one (or my Chicken & Swiss Casserole), where it's used in a different way than the usual lump of mush on your plate. I found this recipe in a Kraft magazine and was pleasantly surprised at how fast it is to prepare and how tasty it ended up being. The best part is that you probably already have all of the ingredients in your pantry. Sometimes I'll buy the stuffing in a 8 oz package and just use 4oz so that I have some left over to use in another recipe. And sometimes I have a little less chicken or a little less mozzarella than called for. The point is, you can eyeball the ingredients and it really won't matter much. The flavors are all still there and it comes out great every time. Try some grated parmesan or pecorino romano to top it off and you won't be disappointed! 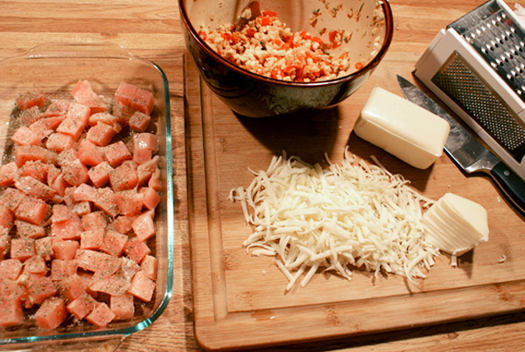 Combine tomatoes and their liquid, stuffing mix, water and garlic in a bowl. Place cut up chicken in the bottom of a 9x13 glass baking dish If you're scaling the recipe down and using less chicken, use a smaller dish. Sprinkle the italian seasoning over the chicken, followed by the mozzarella. 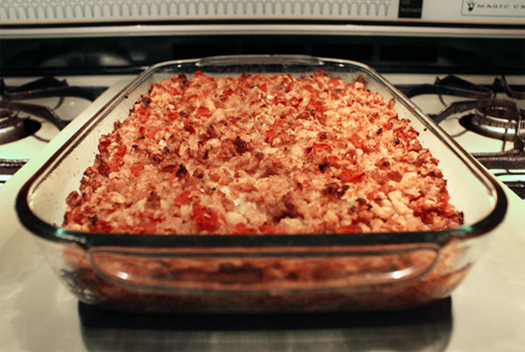 Top with the stuffing mixture. Bake for 30-40 minutes, until the chicken is cooked through and the top is golden and crusty.